These days it seems that many things simultaneously eclipse and exacerbate long held fears for our planet. While Donald Trump meddles incompetently with the affairs of the world, his bumbling, dangerous actions apparently trivialise the very things he threatens. Surely only a fool would propose building a border wall with Mexico or set about operating global diplomacy on such an improvisational level that it’s uncertain what relationship the US actually has with Russia or China? Most satirical media responses are necessary and provide light relief, but concentrating on Trump’s small hands, or whether his pronunciation of China sounds a bit like ‘gina could perhaps be seen as a further distraction. We are ignoring the realities and embracing the fatalism afforded us by social media ‘click’. It was in light of this that I felt some pleasure contributing to the recent production by UK / Australian performance company Doppelgangster of Everybody Loses: The Death Diary of Karl Patterson Schmidt; written by award winning Dadaist poet Tobias Manderson-Galvin with ecological raconteur Dr Tom Payne and performed as a compelling one man show by the latter. What Tobias and Tom attempt in this work is to provide a very concise response to the idea of recording, or witnessing our own deaths. The result is an edgy and lyrical interpretation of the true story of the gradual demise of Dr Schmidt (herpetologist), who was bitten by a boomslang snake at the Chicago Field Museum in 1957 and doomed to die 24 hours later. As much as he realised this, he was driven to record his own passing in diary form. Maybe he didn’t believe he really would die, or perhaps – when it was quite obviously too late – his diary changed tone and became ‘the death diary’. The allegorical weight is obvious. This approach is typical of Doppelgangster, never shying away from visceral and prescient responses to our global troubles. Company Directors Tobias (MKA: Theatre of New Writing) and Tom (Sheffield Hallam University) engage with urgent themes such as the climate change and the Anthropocene in a way that challenges how we hide in distractions and fatalism and addresses our failings directly through provocative and agile performance pieces. This business comes with some risk; indeed Doppelgangster must surely be one of few performance companies to have an event cancelled because of serious health and safety concerns (electrocution and drowning). It is in this unflinching response that change is facilitated. Direct confrontational live documents will strong-arm opinion. Both Tom and Tobias have quickly become masters of this piratic form; to see these maverick performers in action is to be handed your opinion. Unlike the documentary film, which passively pleads to be noticed, this performance approach makes demands. The more I consider the documentary as a vehicle for change, the more I question its efficacy; despite Michael Moore’s Bowling for Columbine (2002) Vegas happened. Is Doppelgangster pioneering the next way to speak out, in hybridised protest/performance? Muscularly battling fatigue and apathy it’s worth noting the past and planned schedule of this innovative performance collective, both a list but also the echo of a yell or a sharp intake of breath for the next round. Making what began as promotional videos for this project, quickly became somewhat rooted in my own filmmaking practice and the not inconsiderable effort I had spent making Forecast (2015), my feature documentary about climate change in which I walked the Wales coastal path from Ramsey to Bardsey posing climate related questions to those I met along the way. Filmically, these works ultimately ask how we might encapsulate the auto-ethnography of impending death? The initial challenge with Everybody Loses was how we might summarise in ‘bite size’ social media films the peculiarity of Schmidt’s endeavour and the seeming connection to our own death drive. Neither Tom nor myself made light work of producing the videos for Everybody Loses. Tom was keen that each sequence be timed precisely so as to fit with the rhythm of the performance text and Melbourne based duo Maria Moles and Adam Halliwell’s hypnotic and percussive jazz score. In the pursuit of precision and with openness to improvisation, I used a Glidecam and a 50mm prime. Capturing Tom’s dances and movements happened only through the control of the focal length in direct relation to his moving body at various sites in the post industrial wastelands outside Sheffield. Filming in this way allowed the creation of the record itself to become part performance and a genuine collaboration. 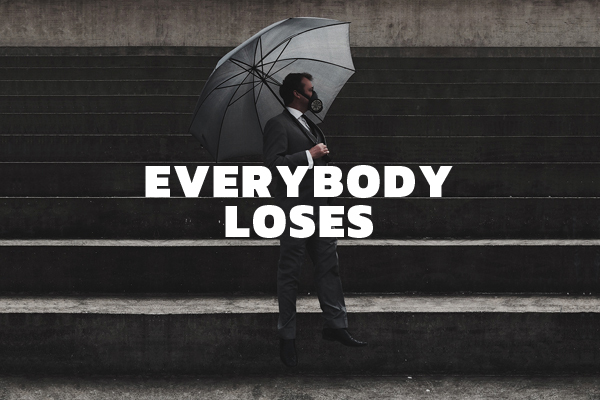 Everybody Loses: The Death Diary of Karl Patterson Schmidt is an expanded theatre project, or perhaps a piece of expanded cinema. The show will go on (planned events are quickly taking shape) and these video vignettes serve to illustrate, across platforms, this powerful allegorical tale. These films serve as rhizomatic media texts, joining the virtual to the living; the already dead, shot and edited media text is woven into the living performance. In some ways these are created in non-linear, pixelated environments, but engaged with the live performance, they continue into the architecture of the theatre space and link that space to the mise-en-scene of the films. If you didn’t manage to catch this critically acclaimed performance, keep a close eye for the show coming to a location near you.